Come dig in the Caribbean – Circle CRM Group Inc. 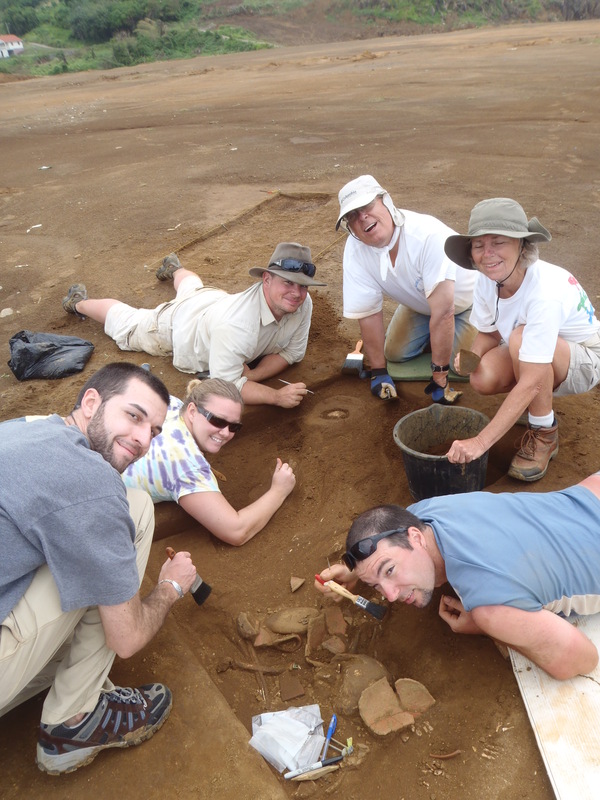 In January 2011, we embarked on the pilot season of The SVG Public Archaeology Program… and it was a success. Volunteers came from around the world to excavate at the site of Argyle 2, on the Caribbean island of St. Vincent. We identified numerous features, excavated postholes and pits, and slowly but surely recovered a number of burials. AND we found two complete pots! These are now proudly displayed in the National Trust museum in Kingstown, SVG. The BIG news is that we have now been approved to return for another season! So, all of you that thought you missed out have your second chance. To top it off, we have lowered our fees, just a bit, in hopes of getting a few more of you on board. Remember that this is a not-for-profit program; we are doing it to rescue and record a significant site, and to help raise awareness for archaeology in St. Vincent, as well as help increase the knowledge of their prehistoric past. What are you waiting for? Sign up, tell all your friends, escape from next winter! Visit www.svgdigs.com for more info.